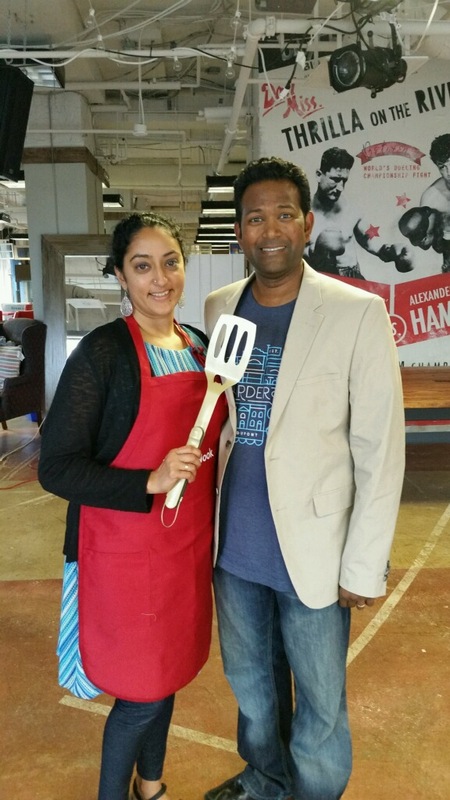 Thanks to my publicist and sous-chef, aka my husband’s encouragement and assistance, I entered a cooking contest the other day, and I was crowned the best home cook in DC yesterday (thanks CookNook!). I’ll share the recipe here, but first I have to say that I feel pretty honored to have been chosen from among a field of 10 other great cooks. And I really couldn’t have done it without the nudge from my husband–not to mention his skills as my maitre d’, telling people about the dish. And from my friend Tala, who helped me to put moussaka into a hundred little cups. So the recipe I used, which the judges said tricked them (they didn’t realize it was meat free) was a teensy modification of this recipe I posted a few months ago, which I think is pretty good itself. What’s different? A mixture of seitan products, instead of one, and an addition to make my bechemel (or faux-chemel) a little creamier. Also the addition of mushroom farro on the side. Peel your eggplant. Then slice into 1-2″ pieces. I sliced them lengthwise for my first few tries. yesterday I did rounds. I’m not sure which method is better. I put down parchment into a baking pan, and then spread my eggplant into a single layer. Drizzle with olive oil and sprinkle with salt. Now you have two options: 1) broiler: turn your broiler on low, and put in one tray at a time for 5 mins each, flipping and returning to heat for another 5 mins. or 2) oven: preheating your oven and turning it to 450. Cook for about 10 mins or until your eggplant is softer and has a little color on one side. Flip each piece with tongs and return to the oven until the other side is lightly golden. This allowed me to do 2 trays at once and did not require me to be as hyper vigilant about burning as I need to be when broiling. In a sauce pan, sautee your onions, garlic, and shallot in a little olive oil. Add in your tomato puree (I like the kinds that come in a vacuum sealed box or in a jar rather than from a can). Add your cinnamon stick, all spice, clove, oregano, thyme, basil, red chilli flakes, and salt to taste. in a saucepan, add in your creme fresh, marscapone, and ricotta. turn it on medium and stir. When it starts bubbling, turn it down to a simmer. Add in your 3 eggs, mixing in well–quickly. Add in a sprig of thyme, a little basil, and a few turns of black pepper. I added chilli flakes to it as well. Cover and let this simmer for 20 mins too. So far, that’s a bunch of steps, but all pretty easy, right? In a normal moussaka recipe, this is where you would cook up some lamb. Instead, we are going to use seitan. Add your crumble and your “sausage” log to a food processor (or blender) and process into a finer crumble. (I used the specific products above for a mixture of spicy and plain. You could use all of one, and none of the other, or you could use other flavors or brands–experiment. My key here was that I wanted one to have a little spice–to emulate what people tell me chorizo tastes like. Pour this mixture into a skillet and warm it for 4-5 minutes. Layering it all together. let’s bring this home. In a casserole dish/corning dish/8×10 baking pan, I put down a piece of parchment…makes clean up easier later. You can omit…but you’ll have more scrubbing to do. Repeat 2 more times or until you use all of your ingredients up. Your last layer will be white. Pop the whole thing into the oven for 35 minutes or until your top is a little golden and the cream is thickened. Slice up and enjoy! chop and then sautee your onion, garlic, and shallot in a little olive oil. Reduce to a simmer and cover. Cook 20-30 mins. You want it to be firm and a little chewy, al dente, like pasta, not too much bite that you’re constantly chewing, and not mushy. In a skillet, cook your mushrooms with a little olive oil until they release water and start to brown a little. Add mushrooms to your farro and drizzle on the truffle oil if you’re using it. Chop your scallions and mix in. 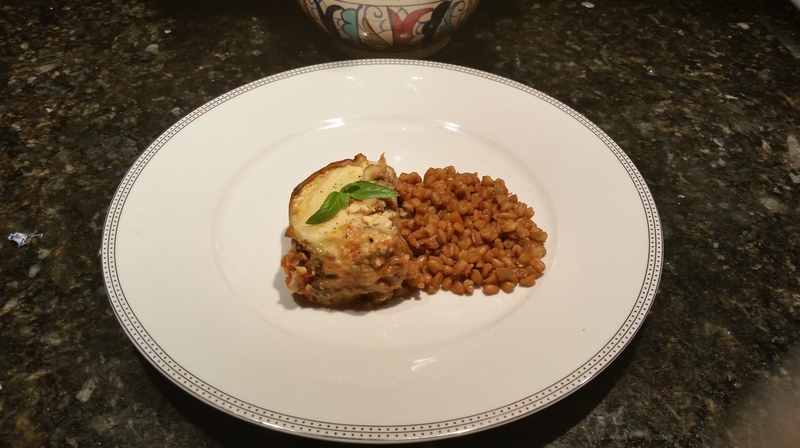 This entry was posted in main dish, Recipes, vegetarian and tagged cook nook, eggplant, farro, field roast, greek, moussaka, mushroom, seitan, truffle, upton, vegetarian. Bookmark the permalink. Hi Vidya just seeing his now. I’m so glad the recipe worked and excited to see your blog. It looks great!